Culture | Often the design of lamps used in the cafe is an essential element of the interior and becomes a feature of the cafe. In this cafe lights are lowered to the table and by the light does not give visitors to focus on the ventilation system on the ceiling. Often the design of lamps used in the cafe is an essential element of the interior and becomes a feature of the cafe. In this cafe lights are lowered to the table and by the light does not give visitors to focus on the ventilation system on the ceiling. 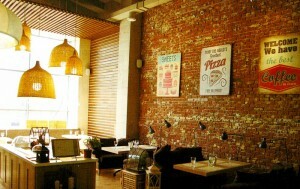 The interiors of restaurants and cafes in Russia. Youth cafe – a combination of incongruous.The combination of black and red furniture is very bold decision for the restaurant. Black stretch ceiling and floor tiles that follows the contours of the ceiling include furniture in the interior of a cafe.